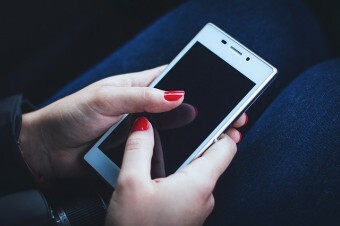 Home »Blog » Should You Catch a Cheating Spouse Using Spy Apps? Should You Catch a Cheating Spouse Using Spy Apps? If you’re reading this, you’re likely to be asking yourself if using cell phone tracking software could be a good way of finding out if your significant other is cheating on you. The short and simple answer is no. Absolutely not! I would start by warning you to steer clear of any websites suggesting the use of cell phone spy software for this purpose. It is almost certainly illegal to spy on your spouse, and could get you in trouble. With that said, it would be a lie to claim that no one ever does it. In fact, besides parental control, and employee device monitoring, the third largest group of cell phone tracking consumers are husbands or wives wanting to monitor their partner’s activities. I prefer to remain completely ethical and honest on the matter, and the truth is that many websites will provide you guides to facilitate this type of activity, only to earn a commission on the sale of the software. On this website, we commit to provide you important information regarding such activities, and what you should know about these services, and how they will handle any cases brought to them by authorities. An ethical piece of advice is to simply not do it. Do not use cellphone tracking apps to catch a cheating husband, wife, boyfriend, or girlfriend. I am not for a second trying to insinuate that you don’t have the right to know, but doing it this way is breaking the law and could land you in trouble if you get caught. You absolutely have the right to know if your partner is committing adultery, however, collecting data or recording calls without your partner’s prior knowledge does not necessarily play in your favor. Federal law would make the information invalid in a court of law, therefore besides informing you of what you might already know, the advantages are slim. Before making the decision, you should at least consider your options, and be aware of the pitfalls. In the past, many vendors made the choice to actively market their cellphone spy software to the cheating spouse market. This caused a ton of backlash by affected parties, that decided to pursue the service providers themselves, claiming that they service facilitated their ex-partners from unknowingly spying on them, and breaking their right to privacy. StealthGenie completely shut down after authorities came after them in court, and arrested the head of the company. Other vendors such as Retina-X, makers of both Mobile-Spy services and PhoneSheriff apps, no longer have actual stealth monitoring apps. They are now forcing their app to be visible on the phone, and regularly bring a popup message to warn the user his or her device is being monitored at all times. Since then, little to no vendor directly markets to this audience in fear of reprisals. If you suspect your lover to be cheating on you, you must try to approach the situation as calmly and composed as possible. The last thing you need is to lose complete composure, and say foolish things, or make any kind of verbal threats. 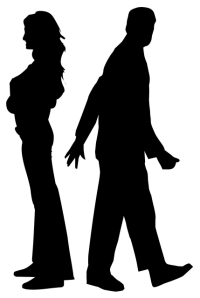 Infidelity is an extremely sensitive situation to be part of, and being calm and in control can be the most difficult part of dealing with the situation as maturely as possible, but will save you from further regret, or embarrassment. The first, and initial approach should always be communication. Approach the issues face on, and try to talk them out as adults. Through communication and understanding, you can possibly come to a crossroads of repair, or closure on this relationship. Remember, if cheating is involved, the relationship is already in hot water. Ignoring, or refusing to face the problems could never amount to anything positive. Seeking marriage or couple counselling would be most beneficial at this stage. Professional assistance can provide the insight necessary to fix your situation. Some basic advice is to take time and reflect with the choices you are faced with. If you hope to fix the relationship, than you must enter this ordeal with the ability to drop any chips your shoulders. It will require you to be understanding, and also require forgiveness. You must come to face with the fact that you may be partially responsible for the cheating, and in no way deserving of it, but there might be more that you can do. Just take some time to reflect on what the relationship is missing, and what part you can take to help. If talking is not an option, and you absolutely want to catch your partner, the usual best option is to hire the help of a private investigator. PIs operate with a state license that allow them to surveil, and collect information for their clients. They can also provide legal advice, and assistance in preparing a divorce case. They are experienced, and know the laws surrounding their field very well. Just like spying on a spouse with cell phone apps is illegal, private investigators are not allowed wiretapping, or GPS tracking individuals. They are left to operate in more manual ways, but it is not to say that none of them bend the rules. Often, we hear stories of investigators operating in grey areas and utilizing technology to their advantage, but in most cases, they will not cross any laws, as the evidence collected must be valid to be used in your divorce case. The only real disadvantage is the cost. Hiring a PI can be compared to having to hire a lawyer. They have layered costs that never seem to end. Not only will you be paying your investigator for the hours he or she works, but additional fees can be added for photos, recordings, and travelling costs. A basic service will usually be at least one thousand dollars, and additional services will run you into multiples. If you still decide to attempt to spy on your partner’s text messages, calls, and locations, by installing cell phone spy software on their smartphone, you should be fully aware of your state, or local laws. As mentioned, in most places it is completely illegal to spy on someone without them knowing about it. Although you have a right to install tracking software on any cellphone you own, the person using it should be made aware, and if you do not own the device, than you have no legal right to install the software on it. If you do so, you better hope you do not get caught. And if you do get caught, you better hope that you do not get charged for committing a crime by the person you spied on. The upside of not getting caught is also questionably invaluable. Since you will not be able to use your gathered data in a divorce settlement, the best it can do is provide undeniable proof of actions committed by your significant other. But, will it help your relationship get better, or bring proper closure? Only you can answer that question. If you’re still set on doing this, read on the next section about service and legal agreements, and how pretty much all service providers legally protect themselves in case of a court order against them. As mentioned previously, if you get caught, cell phone tracking app companies will in almost every case, fully cooperate with authorities, and hand over all of your information. They do so to comply with federal and state laws where applicable, and in order to protect themselves and stay in business. Below I collected the service agreement sections for each of the service providers. Remember that by signing up to the service, you are agreeing to their terms. The only popular cell phone tracking service I know of that actively advertises to spying cheating spouses is FlexiSpy. They have somehow managed to escape regulation regarding this type of advertising, and still offer the ability to record calls, and remotely activate the camera to film the surroundings. These invasive features are certainly a plus if you’re looking to catch your significant other in the act. 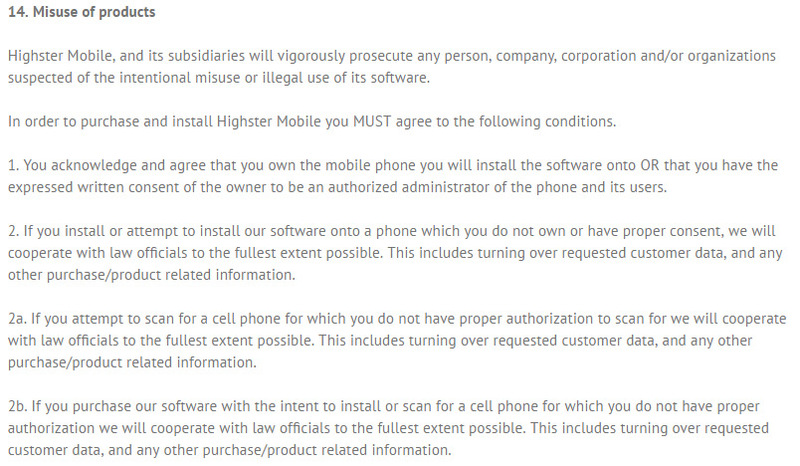 However, just like all other cellphone tracking software vendors, they too have a legal disclaimer that claims they will disclose your information to authorities when requested to do so. Read our full service review here. Just like any other cell phone monitoring service, they will cooperate with authorities in case of legal proceedings with court orders. Read our full service review here. All three providers come from the same company, and will cooperate with authorities by sharing all your data. It’s also worth noting that this provider sells your private data regardless, by claiming ownership on their service agreement. Read our full service review of Highster Mobile here. Both of these services come from the same company, and can no longer be considered stealth monitoring apps. Not only will they terminate illicit usage, but it is impossible to hide this app. Not only can you not delete the icon, the service will also periodically advise the user that the device is being monitored. Read our full service review of Mobile Spy here, and PhoneSheriff here. SpyBubble is not currently in service, but it was once popularly advertised to spy on your partner to catch them cheating. Even if the service comes back online sometime soon, they will fully disclose your information, if authorities were to request it. Read our full service review here. As a final note, I hope that you reconsider your decision to use this kind of software in any illicit way. 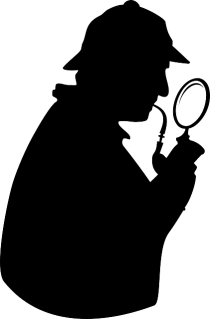 If you cannot afford the cost of a private investigator, try the communication approach. Make sure to know what you want, and to be ready to accept that things might turn out completely opposite. But in the end, spying on your partner will usually never provide a better result for your situation.